Biochar has been called a modern twist on Terra Preta, the legendary man-made fertile soil of the Amazon basin, but the two are not the same. If you've never heard of either of them, you're not alone, but I hope we'll be hearing a lot more about both in the years to come. Depending on where you research, folks seem to view biochar as some sort of snake oil or the answer to sustainability questions everywhere. Personally, I think the truth is somewhere in between – that biochar is one piece of the healthy soil puzzle, and used correctly, charcoal based soil amendments can increase soil fertility for years. 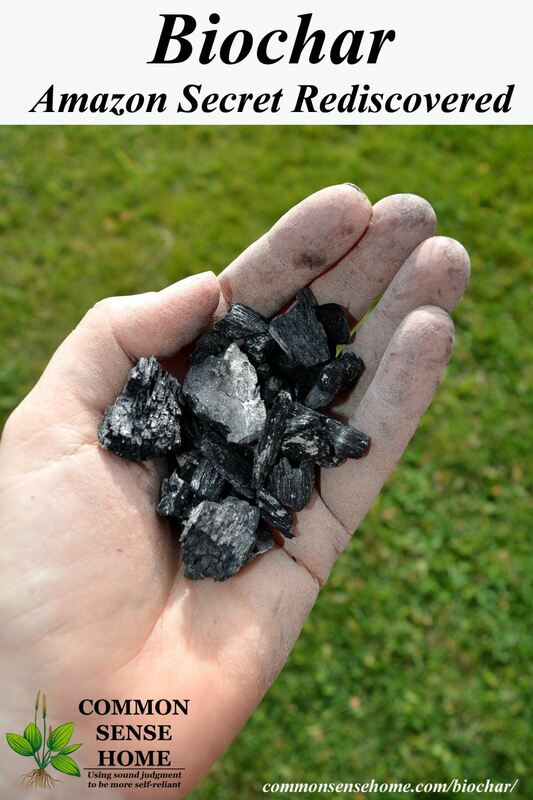 In this post, I'll discuss both biochar and terra preta, how you can put charcoal to use in your homestead and garden. I believe that if you use your biochar much like it was used to create terra preta, you'll have very good results. For the home gardener, it generally starts out as charcoal salvaged from a wood stove, or as brush or wood that is burned in a low/no oxygen environment (pyrolysis). The “big kids” have specialized furnaces where pyrolysis of biomass produces three products: one liquid, bio-oil, one solid, bio-char and one gaseous (syngas). Biochar can also start out its agriculture life as a feed additive, with the resulting manure being composted and applied to the soil. Studies have shown that as part of a feed ration, biochar improved animal health and reduced odors. Other uses include adding the biochar directly to the litter for odor absorption, and water filtration. TP soils were likely created between 500 and 2000 years before present by pre-Colombian Ameri-Indians. TP soils high carbon levels with between 3 and 6% of the soil consisting of pyrogenic charcoal corresponding to up to 150 grams carbon per kilogram soil compared to surrounding Ferrasols and Oxisols which contain practically no pyrogenic charcoal and have carbon levels of 20 to 30 grams carbon per kilogram soil. TP soils are prized by growers of papaya, mango, and other high-end crops which are reported to grow nearly three times as fast on TP soils than on neighboring soils . The high fertility of TP soils explains why locals routinely excavate and bag TP soils to be sold as a soil fertilizer and conditioner. There's no clear record of how terra preta was created – but it appears to be a part of the waste processing of the indigenous peoples. However it was done, it's important to note that it was not magically created overnight. This deep, rich soil was likely deposited over centuries. Another important point – this soil is still retaining nutrients at an amazingly high rate, even though it is centuries old. Contrast this with typical slash and burn agriculture, which results in worn out soils in a few short years. Clearly, this is a technique worth reviving. BBC did a pretty amazing documentary on Terra Preta, for those who would like to know more. One comment I found particularly interesting – “a natural order that includes people”. That's the way it should be, no? So where do the “snake oil” claims come in? Well, some of the folks who are very pro-biochar are aggressively promoting it as a way to “stop climate change” and “lock up CO2” – like in this post, “Biochar: The Original Soil Amendment to Mitigate Climate Change“. The thing is, the studies on this aren't conclusive – but people are playing the game with carbon credits and lots of cash changing hands. In the article “Beware the Biochar Initiative“, PermacultureNews.org makes a pretty convincing argument that using biochar to lock up CO2 is not a good allocation of resources. In that regard, I'd have to agree with them – so from here on out we're just going to focus on soil building with charcoal. At its simplest, all you have to do is save the charcoal from your wood stove and till it into the soil – but I wouldn't recommend this unless you can leave that land fallow for a while. I'll explain more in a bit. Alternatively, you can burn wood or woody brush, and quench the fire with soil or water one the wood reaches charcoal stage – before it turns to ash. A quick search on youtube will also provide more complex burning options ranging from burn barrels to completely enclosed burners dedicated to producing biochar and biofuels. Once you have your large charcoal chunks, it's best to break the chunks into smaller pieces to maximize surface area. This can be done via simple mechanical force (beat it with a hammer or step on it), or via a mechanical grinder such as the option described in The Planet Whizbang Idea Book for Gardeners. I had a garden tub about half full that I saved from last winter, so I just beat it with a sledgehammer. Note: When working with charcoal, you may want to wear a dust mask, as you should not be breathing large amounts of the fine powder. Trust me, it gets all over everything. I took a bath afterwards and left a charcoal ring in the tub. The biggest mistake to avoid when using biochar is to use raw biochar, i.e., just using charcoal straight from the fire. Raw biochar can stunt the growth of your garden! All those wonderful little pore spaces in the charcoal that make such a great home for microorganisms and nutrients need to be charged with those nutrients so they can release them to your plants. If you don't pre-charge the biochar, it'll grab the nutrients and microorganisms from the soil and lock them up. You'll note in the terra preta video that the terra preta was built by combining other organic wastes with the waste charcoal, and then the combination was left to age before it was planted in. So – how do you make sure biochar improves your garden instead of stunting it? You can combine old school and new school and mix it in your compost. 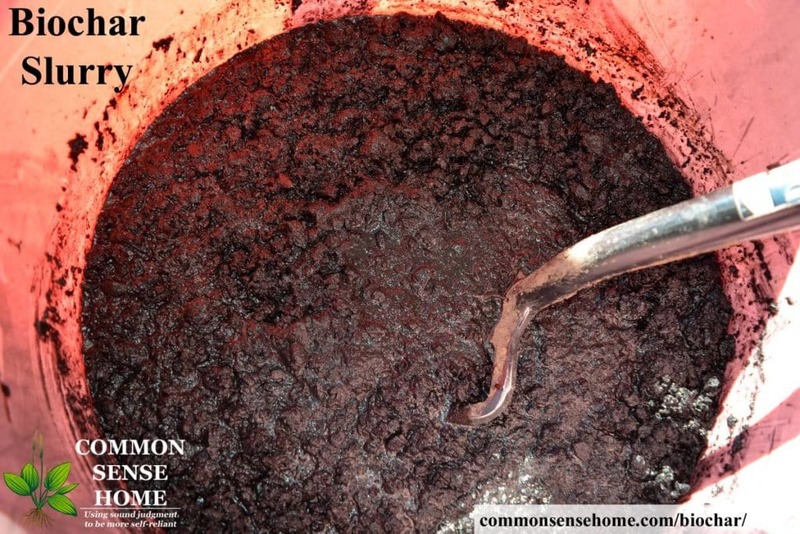 When the compost is ready, your biochar should be, too. *Note – this is different than just dumping all your wood ashes in the compost, which can potentially make it too alkaline. Sift out the charcoal from the ashes. You can make your charcoal do double duty by feeding it to critters or adding it to their bedding to reduce odors and improve health, and then compost the waste and add it to the garden. 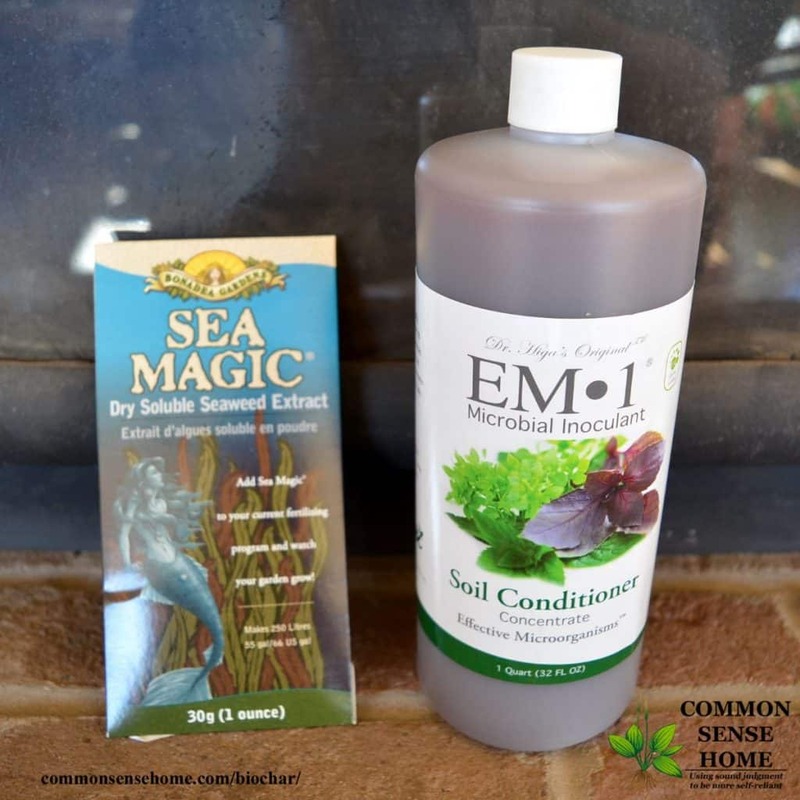 Another way to charge your char is to soak it for a few days in compost tea, manure tea, liquid fish fertilizer or some combination of all three – or your favorite liquid fertilizer mix. Since I wanted to get ours in the beds this fall, I used this option, combining Effective Microorganisms and Seaweed Magic into a lovely warm charcoal slurry. 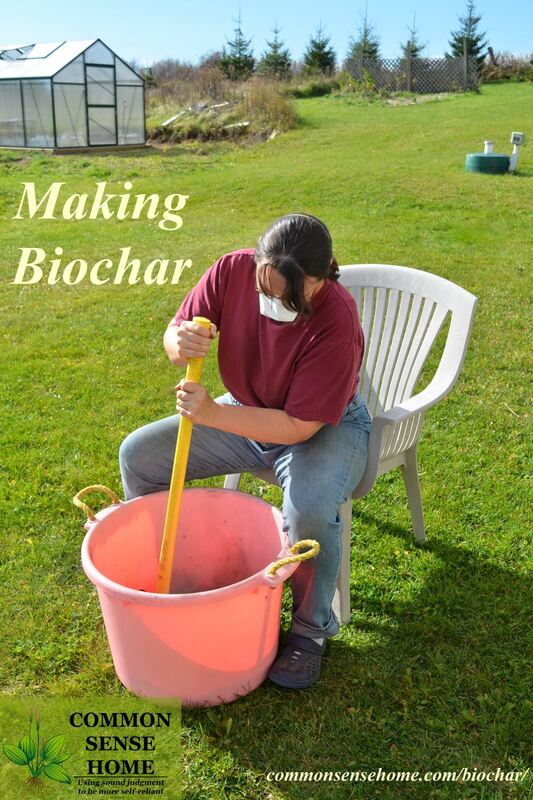 Once you have it charged, simply work your biochar into the top few inches of soil. If you're confident the char is full of nutrients, you can work in right before planting in spring. If you're unsure about the level of biological activity and nutrients, it's safer to work it in during the fall. This will give it time to get charged with microbes from your garden. We had enough this fall to lace one of my square beds, plus half the greenhouse and half the garlic bed. (I did half of those two areas to test how it works.) I'll let you know next growing season how the experiment turns out. 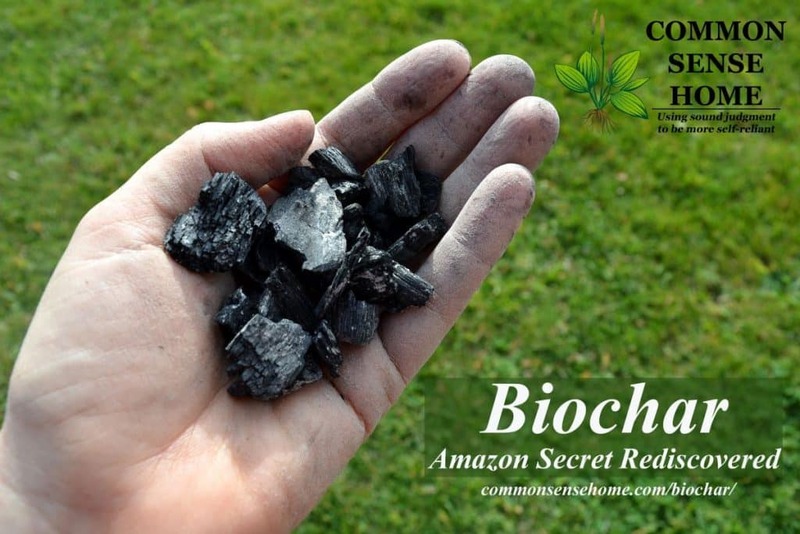 Have you ever heard of biochar or used it in your garden? If so, I'd love to hear from you. Have biochar questions? I'd love to hear those, too. This is a new tool for me, but it's been in use for a very, very long time. Well, here we go again: It’s time to learn again that a little knowledge is a dangerous thing! I’ve been dumping my wood stove ash in the greenhouse for years now. Thanks for telling us about the fish fertilizer. I’ll have to do this too. But maybe explore the other options, b/c the smell factor might be overwhelming. I’ve used commercial biochar extensively for the past two years and I have observed absolutely no noticeable differences in plant growth. I wonder if whatever type you were using was adequately charged with nutrients? At least it didn’t stunt plant growth. I used “bio char” soil with lactic acid bacteria to grow cucumbers in very small beds. The bottom leaves were 10 inches across. I grew 40 cukes in 22 1/2 by 22 1/2 beds. The seeds were planted on July 4th. Thanks for sharing your experience, Daryle. Pounding charcoal in a tub will break it down to “bio-char” consistency, I did it once. One of my neighbors has a 10 yard dump truck. The truck weighs 60 to 70 thousand pounds loaded. Put a bag of charcoal on a concrete drive and have the truck drive over it twice or maybe three times. It may take as much as a minute. Perfect finished product.